It’s been just about a year since I purchased an oversized tank for freshwater fish. I wanted to surprise my children on Christmas and found an insane deal last Black Friday. I think I spent about $99 for a 65-gallon tank. I had no idea what that meant, of course! All I saw was the percentage off. The deal saved me hundreds of dollars which meant that I was IN. However, when the tank actually arrived to our house, we were SHOCKED. It was H-U-G-E. Much bigger than we anticipated!! But… we rolled with it because there was no turning back at that point. 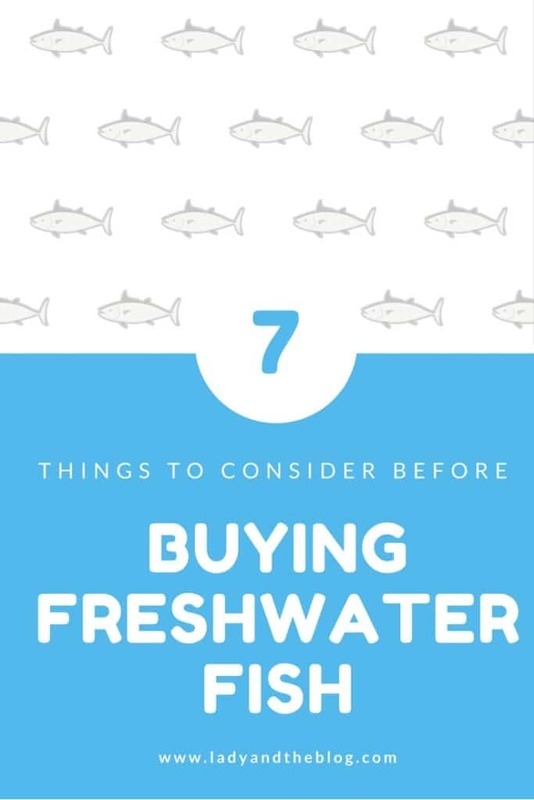 Over this last year, my husband and I have learned quite a few things about caring for freshwater fish and I wanted to write a post dedicated to any potential parent who is considering making the purchase. I am going to be completely HONEST here and I hope you appreciate that. I want to apologize in advance to any freshwater fish lovers… but this is my take on the whole experience. (1) Freshwater fish have babies: We started our tank with about 10 fish which is not much considering we had the 65-gallon tank. I think you are able to get one fish per gallon (or something like that) according to “the rules.” We intentionally left them a lot of room to roam to swim. But over this last year, TWO of our freshwater fish had babies. LOTS of babies. The first lot was eaten by another fish which made my children CRY. The second lot somehow survived and now I have double the amount of fish I started out with! Like I said, we have the room for it. But BOY – we are fearing the next year or so. If everyone can have around 8-10 fish and there are 10 fish in the tank… well, I can’t do fast math, but it feels like it could mean trouble. We are carefully eyeing the situation. PS, I was stupid enough to ask the guy at the pet store to only give me one gender and he flubbed around acting as if he was doing just that. I was FOOLED, my friends. FOOLED I TELL YOU! He was probably laughing in his head at such a question. (2) You have to clean the water every other week: If you purchase a small tank for your freshwater fish, you might be ok with this chore, but we have 65 GALLONS OMG SOMEONE COME AND SMACK ME. My husband has to take out like half of the water each time and refill it with fresh water and it is just a disaster. We’ve purchased things to make the process easier, but it’s still wet and sloppy and he always ends up mumbling through in total annoyance. This is one chore he literally HATES. We have joked that we are “this close” to hiring a service to come and do it for us. Although, I’m not so sure he is joking??? (5) Vacations become an issue: If you have a dog or a cat, you can just send them over to Grandma’s house while you are away. However, what do you do with a 65-gallon freshwater fish tank??? You need to have someone come to your house every single day while you are away. And typically, my husband and I go away for about 7-10 days. That is really putting someone OUT for a long time. You better have a great payback in mind. Think wine, chocolate, lotto tickets – SOMETHING! It’s annoying and my cousin probably HATES me because she has her own things to do. But the fish will die if you don’t feed them! You have to figure this out. (6) The kids eventually stop caring: I know. You probably think that your children are 100% invested in these future freshwater fish, right? They just look SO EXCITED RIGHT NOW. It ends after three days. Make no mistake. The only person who will continue to care about the fish will be YOU and it will mostly revolve around the fact that you HAVE TO in order to justify the expense. Sure, I sit while eating dinner and I watch them float around. But you know what? I wouldn’t CARE if I didn’t have them. They are nice to look at but they aren’t changing my life for the better. It’s mean – I told you I was going to be honest. I am LITERALLY the only person who sits next to them when I read or write. And I think I force myself to do it. It’s a passing phase for everyone else. For me, it’s a forced commitment. Is that how you want to choose a pet? Meh. (7) Freshwater fish require levels testing: It’s not just the water cleaning that you have to worry about. You also have to put things into the water to make sure the levels are neutralized. My husband takes care of this and honestly, I can’t say much more about it. All I know is there are dipsticks and liquids and droplets that you have to deal with when caring for freshwater fish. I have three kids! I can’t handle much more. If I didn’t convince you by now to get a small tank, I don’t know what will. Leave the big tanks to the restaurants and the doctors’ offices. You don’t need that kind of hassle in your life. Do you have freshwater fish? What kind of tank do you own? Does your family still care about the purchase? Or has everyone simply forgotten! Would love to hear whether or not I am alone on this one.